Here's M*nd*y looking at you, kid. PS: Frankie was Mike's first bunn. Sonoma Humane Society update: http://sonomahumane.org/fire/ This is a fire specific page now and contains much more info than it did before. If you choose to make a donation, you can select NorCal Fire Relief as the cause you want to support. We did, in memory of Mr. Bun. Nose in the cream bowl again!!! This picture of Frankie is a reminder to all bunny servants to continually add apologetic words and phrases to their vocabulary (i.e. "Whatever I did, I do apologize." and "Yes, it was all my fault." and "Hoomins are clearly inferior to bunnies, forgive me." etc.). What an elegant rabbit! 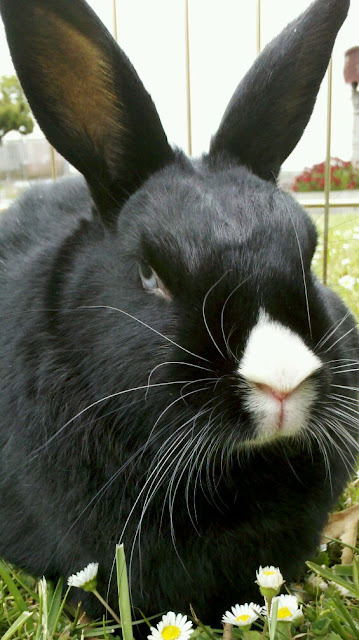 The nose, so important to rabbit disapproval, is a snowy white against the jet black face fur. It really makes a statement.